A great bit of a brick training on display by everyone this morning from the squad. As predicted last night, it certainly ended up being a solid session, but I didn't have anyone openly curse me about it, so I am taking that as a win. As I wrote about yesterday, brick sessions can be pretty tough and so was the case this morning, made more so by a hilly ride and a sandy run. However, the session this morning was also made just that little bit harder by some unseasonably humid weather. It was a sweaty morning out for everyone for sure. Most people finished with a smile though. While the sessions may be challenging, they also are great for building race day confidence and I think that is what a lot of people took away from today. Now that the brick session is finished it is time to turn my attention to the track session this afternoon with the group from Stadium Tri Club. Similar to this morning, the session tonight is all about race specific focus. In the case of the track run this focus means that the session is all about speed work. While most athletes won't be tapping into VO2 during an Olympic Distance, the race is likely to be quicker than most of them have been doing in their 70.3 training recently. The focus of the run session this afternoon will be to give everyone some time at race pace, but then to also spend a bit of time above race pace, getting the feet feeling fast and fleet. 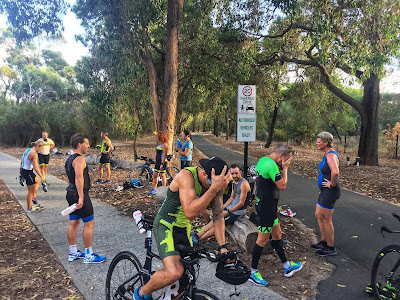 While I don't personally believe that 70.3 and Ironman athletes need to spend much time running above their threshold in training, for Sprint distance and Olympic distance athletes these higher intensity, fast sessions are important ingredients to their race preparation so that is what tonight will be all about. Two very different sessions today, but each of them bringing with them an important bit of race specific preparation.